How well do you think it would work if a bureaucrat in Washington D.C. controlled your thermostat? If they cared to, they could check the current temperature and humidity to decide whether they would turn on your air conditioning or heating. More likely, they’d just guess by region, if they bothered doing anything about your comfort. The Southwest is supposed to be hot, so you'll get some air conditioning whether you want it or not. You'll have to pay either way. What about letting someone in the state capital control your comfort? They'd be closer and might understand conditions better. Right? Or, maybe city hall should be given control. They are closer still, and know what the weather is like here right now. They aren't going to accidentally get confused if it is snowing in the mountains above Red River, believing the weather must automatically be the same at your house. Besides, you can't really be trusted to control your own thermostat, can you? Comfort isn't the only consideration. What if you use too much electricity or gas? Could you afford the bill? Who will watch out for you? On the other hand, you live in reality so you understand that even in a house with only two people, the comfort levels differ. Comfortable to one person is cold to another and sweltering to a third. There may even be medical issues. You will need to compromise among the residents of your house. You can adjust your thermostat to limit the amount of energy you use. Who knows better than you what you can afford and what you can live with? Maybe the thermostat isn't the problem. Should you allow your toilets to be flushed by remote control on a set schedule from some bureaucrat's office? How do you think that would work? It's really no different to pretend government employees have any business controlling anything else about your life. Your medications, your food, your money, your lawn, your chickens, whom to bake a cake for, or which flag to fly- these are all your business, and your business alone. In each of these cases, if someone else has control, you are handing your life to people who are not qualified to control anything. The only reason they are able to take away your liberty is because you, and too many of your neighbors, hand it over to them. Why on earth would you do something so foolish and self-destructive? 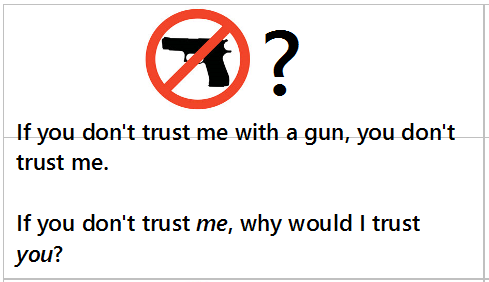 If you don't trust me with a gun, you don't trust me. 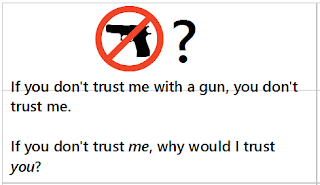 If you don't trust me, why would I trust you?